Shut Up 'n Play Yer Guitar, a project consisting of Shut Up 'n Play Yer Guitar, Shut Up 'n Play Yer Guitar Some More and Return of the Son of Shut Up 'n Play Yer Guitar, is a series of albums by Frank Zappa. Released as separate albums in May 1981 on Barking Pumpkin Records, it was subsequently reissued as a triple album box set in 1982. As the title implies, the album consists solely of instrumentals and improvised solos, largely performed on electric guitar. The album series was conceived after Zappa shelved a proposed live album, Warts and All, and two tracks intended for that album appear on this series. The individual Shut Up 'n Play Yer Guitar albums and box set have been well received by critics, and Zappa subsequently produced two more albums focusing solely on guitar-oriented music: Guitar (1988) and Trance-Fusion (posthumously released in 2006). After the release of Joe's Garage, Frank Zappa set up his home studio, the Utility Muffin Research Kitchen, and planned to release a triple LP live album called Warts and All. As Warts and All reached completion, Zappa found the project to be "unwieldy" due to its length. Zappa later conceived the Shut Up 'N Play Yer Guitar series, which contained two tracks originally prepared for Warts and All. The album is entirely instrumental and features mainly guitar solos, hence the title. It is, however, interspersed with brief verbal comments between tracks, many of which were originally intended for the scrapped album Läther. Each disc is titled after a variation on the album's name, which is shared with the title track found on each respective disc. Most solos on the album are culled from live performances of previous Zappa songs. The three title tracks are derived from successive renditions of "Inca Roads"; various other solos were taken from readings of "Conehead", "Easy Meat", "The Illinois Enema Bandit", "City of Tiny Lites", "Black Napkins", "The Torture Never Stops", "Chunga's Revenge", and "A Pound for a Brown on the Bus". "Ship Ahoy" was the coda from a performance of "Zoot Allures" the first part of which appears on You Can't Do That on Stage Anymore, Vol. 3. 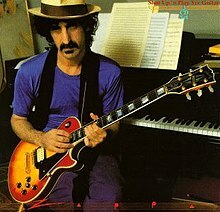 The final track, "Canard du Jour", is a duet with Frank Zappa on electric bouzouki and Jean-Luc Ponty on baritone violin dating from a 1972 studio session. Some of the solos from these albums are featured in written form in The Frank Zappa Guitar Book. The album was well received by critics. Reviewing the album's double CD incarnation for AllMusic, Sean Westergaard wrote, "Frank Zappa [...] was one of the finest and most underappreciated guitarists around. [...] This is an album that should be heard by anyone who's into guitar playing." Another writer for the website, Lindsay Planer, similarly appraised the individual releases Shut Up 'n Play Yer Guitar Some More and Return of the Son of Shut Up 'n Play Yer Guitar, writing of Some More, "it is certainly a wonderful place for interested parties to commence their discovery of the (dare say) many moods Zappa imbued in carefully constructed yet thoroughly improvised compositions such as the seven found here." In regard to Return of the Son, Planer wrote that Zappa "saved some of his best offerings [...] Zappa pours his expansive ideas onto the soundscape with a certainty and purpose that is simply unmatched in terms of passion and inspiration." The album's success led Zappa to produce two more albums solely consisting of guitar solos: Guitar, which was released in 1988, and Trance-Fusion, released posthumously in 2006. Additionally, Zappa assembled the compilation The Guitar World According to Frank Zappa for Guitar World magazine. In 1997, Dweezil Zappa assembled another compilation of Zappa's guitar-based songs and solos, Frank Zappa Plays the Music of Frank Zappa: A Memorial Tribute. ^ Lowe, Kelly Fisher (2007-01-01). The Words and Music of Frank Zappa. U of Nebraska Press. ISBN 0803260059. ^ a b Westergaard, S. (2011). "Shut Up 'N Play Yer Guitar [2 Disc] - Frank Zappa | AllMusic". AllMusic. All Media Network. Retrieved 22 July 2011. ^ a b Planer, L. (2011). "Shut Up 'n Play Yer Guitar Some More - Frank Zappa | AllMusic". AllMusic. All Media Network. Retrieved 22 July 2011. ^ a b Planer, L. (2011). "Return of the Son of Shut Up 'n Play Yer Guitar - Frank Zappa | AllMusic". AllMusic. All Media Network. Retrieved 22 July 2011.